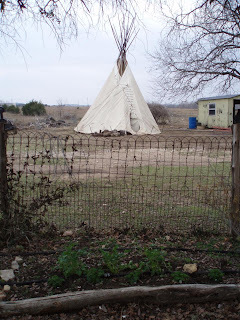 The Redneck Hippie: More planting and irrigation to boot! I'm so proud of me. I got soaker hoses cut to fit the three raised beds in the Peace Sign garden, put hose ends on them, linked them together with made-to-fit sections of regular hose and connected it to the spigot. They're out there soaking the lettuce seeds I just planted. Too Cool. The lettuce I planted are, from west to east (top to bottom in pic), Black Seeded Simpson from Botanical Interests, Matina Sweet from Pinetree and Jericho from Pinetree. I also set the onions out yesterday ~ red (Red Sweet or Sweet Red), white (White Bermuda) and yellow (1015Y) ~ got the sets from Naumann's Feed Store. I also got some seed potatoes from Naumann's and was going to plant them in these beds, but something told me not to (probably my inner child who hates to dig potatoes), so I decided to plant them in some large tree pots I have. That'll make it easier to harvest them ~ just tump over the pot. I haven't planted them yet, so I may put a few in some tires. Lord knows I have plenty of those, and it won't take long with the sawsall to cut the centers out. Those would also be easy to harvest ~ use the tractor to push them over if I can't by myself. ... pineapple mint, bee balm, lemon balm, Mexican mint marigold, and winter savory in another (on the right) and sweet marjoram and Bergarten sage in another (on the left). I need to get a few more things to fill that one out. The little pot in the middle front has one of the brugmansias in it that I left out as an experiment to see if it comes back. So far, one of the others has sprouted some green. I hope all three will.